Gaiters are gaining popularity and for a good reason. One of their best features is that they prevent the bottom of your pants from getting wet due to snow or wet vegetation. While many hunting boots will protect you against water, your pants might not and I personally hate walking around with my ankle and calves wet. The best hunting gaiters should not only shield you against water, but also from having ice and snow stick to you. Which Gaiters Are Right For You? Well, this all depends on what you plan on doing with your gaiters. Are you more worried about game hearing you sneak up? Or do you just want something solid that will shield you from everything from snow to rocks and such? Some gaiters do one thing better than others, so it’s important to choose one that is right for you. Having the correct fit is important as you don’t want something that’s too loose or too tight. If it’s too loose, then you will not have optimal waterproofing, and you can get snow and ice stuck between the gaiter and your boots/pants. Too tight (a symptom of a gaiter that’s too small) is also bad as you will not be able to close the gaiter around your calf properly making it prone to opening if you have velcro only gaiters. Too tight is also bad as it won’t be comfortable and comfort is very important when you are out for long periods of time. You can find the sizing information on the seller’s websites and for some of the gaiters I have provided one for your convenience as well. Breathability is good to have only if it doesn’t cause a compromise in water resistance. Since the more moisture you can let out, the more moisture can technically go in, this means that the materials and fabrics that are used in gaiters have to have the right balance. Fortunately, whether it is Gore-Tex, or 37.5 technologies, the materials used in the hunting gaiter reviews here do a good job keeping water out while letting moisture out. Material strength is also important as you want something that will shield your foot well if you are hunting in places where abuse is expected. You might notice some gaiters claiming to be “bombproof” which is one of the ways that the manufacturers describe the strength of the materials. I think the name’s a little silly, but those gaiters do tend to have some solid durability to back up the claim most of the time. First up are the First Lite Brambler gaiters, a pair of gaiters that were newly introduced in the market. 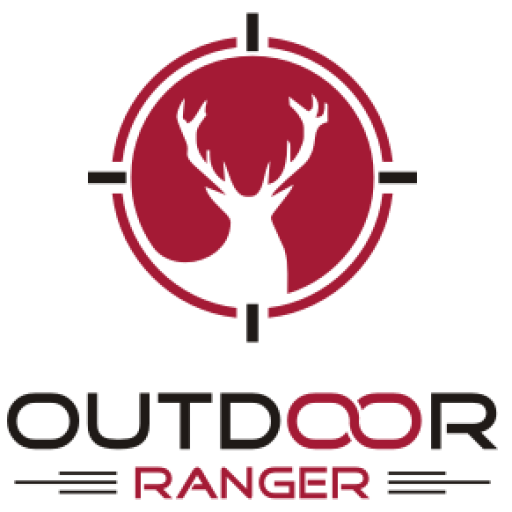 First Lite is a fairly new company that has recently been gaining popularity so I thought I’d see whether they can match up to the likes of Kenetrek. These gaiters have the insteps (inner part of the gaiter) made from Cordura nylon, a tough, yet light, material. The nylon straps are also coated and feel solid. It does say in the description that they are bombproof, although I’m not sure whether that’ll come in useful as I don’t tend to traverse mine fields that much. But I digress; let’s go back to reviewing the gaiters. Regarding fit and comfort, these gaiters feature an adjustable calf strap and seem to fit most people pretty well with no complaints so far. The fabric also has 37.5 technology which helps it to breathe and also maintain the waterproof capabilities. I’m not sure about breathing, but this gaiter does keep your foot or at least the part that’s shielded by it, dry. The small/medium size will fit anyone who has a shoe size 10 and under. Now, while this is a pretty good gaiter, there are some things that First Lite should improve on in the next iteration. Firstly, it’s a little short which makes me wish it would come down to the first lace to extend its waterproof capabilities. The boot strap stowing could also be improved. The way it is now causes a tight fit and tends to make it a pain to get in and out. The durability is also average. While the Cordura nylon that they’re using is a good material, some people have reported that the camo section of the gaiter can sometimes rip, which will severely diminish its usefulness. 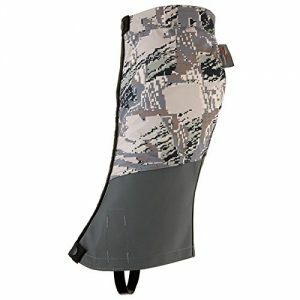 So how do these gaiters stack up against the best hunting gaiters? Not too bad, I would say. As the flaws listed aren’t deal breakers, these gaiters will work well for you if you choose to get them. Now Kenetrek is the brand that paved the way for other companies to start selling and making hunting gaiters. 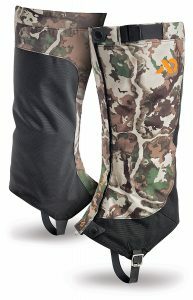 But has it been surpassed or are these still the best hunting gaiters? Let’s find out. These gaiters use the StormBlocker membrane, which, like the 37.5 technology, allows sweat to come out while still maintaining its waterproof capabilities. And, from what I’ve seen so far, these manage to do the job well enough without any issues. Kenetrek also has a solid colored option for these gaiters but those ones are pretty loud and you will be heard coming from a mile away. Luckily, the camo option has a tricot micro fleece exterior which makes it much quieter than its solid colored alternative. However, the benefit of the louder ones is that the nylon outer fabric is much more resistant to ice and snow sticking to it. A great feature that these gaiters have is the removable and replaceable Hypalon rubber straps. This is great if you don’t want to send these gaiters back for a replacement. They weigh in at 10.4 oz. and the bottom portion is made from 1000 denier nylon. The top cinch is a nylon strap which kind of looks like a level buckle. However, while it has no problems fitting bigger feet, some people actually find it to be too big in the top area. The large size has a top circumference of around 19” when the Velcro is overlapped and a bottom circumference of 18”. If you have big calves then don’t worry as you can gain another inch in circumference if you don’t fully overlap the velcro but still close it enough to hold it secure. Talking about holding it secure, you also get a standard hook at the bottom which you can connect to a shoe lace so that the gaiter won’t ride up. All in all, this is a great gaiter, and for its price, the Kenetrek hunting gaiters are definitely something that you should consider. You can get them in 2 camo options: Realtree and Hardwoods Snow. Sitka is a brand that has a good reputation when it comes to making hunting gear and their gaiters are no exception. First up, the upper is made from Gore-Tex fabric. Gore-Tex is yet another variation in a fabric that releases moisture but prevents water from coming in, like the StormBlocker in Kenetreks. And just like Kenetreks, this fabric works well. The lower portion is made from full Hypalon rubber. Because of this, it feels like these gaiters can take a lot of abuse without any issues whatsoever. Complementing the Hypalon rubber are the heavy duty zippers and the velcro storm flap. There aren’t many gaiters on the market right now that have a heavy duty zipper, so this is always nice to have. The boot straps also feel very solid and may even be the strongest ones out of all the choices in this list. The strap adjustment is also located on the inside, same as the top adjustment, which means that there’s no chance of it getting caught up in a thick brush or be damage by a rock. Plus this prevents the chance of it snagging or breaking. However, this durability comes at a cost. Firstly, it literally costs more than other gaiters. Whether the great durability is worth this much, depends on you. Secondly, these gaiters are not as quiet as some of the other choices. If you care about noise, you should look into the Kenetreks instead as the tricot micro fleece exterior on those makes them significantly quieter than other gaiters. Finally, some other specs of these gaiters include a weight of 1 lb. and a 16 inch height. If you want some really durable gaiters that can withstand a lot of abuse without any issues and don’t mind the noise, then the Sitka Stormfront gaiters are a good choice for you. 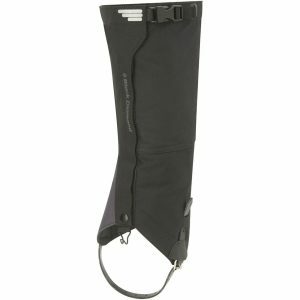 Now this gaiter isn’t specifically marketed towards hunters but I thought I’d include it on the list simply due to its durability and build quality. The Black Diamond gaiter has strength that rivals those of even the Sitka Stormfront. The upper is made from a 3 layer welded hard-shell Gore-Tex membrane. This gives it strength while also maintaining waterproof capabilities. However, even though Gore-Tex itself allows for moisture to escape, the 3 welded layers together limits the breathability. The bottom is a double layer 600D abrasion guard which is also very strong. And since this was designed to withstand ski edges, these gaiters won’t have any issues with mountain hunting. To finish the gaiter off, you get a boot strap made from a high-density neoprene coated nylon. Now, since it’s not designed for hunting, these aren’t the quietest gaiters that you buy, but they are some of the most durable. Plus, these gaiters are much cheaper than the Sitkas so if you want some really solid gaiters at an affordable price, the Black Diamond Apex gaiters are a good choice to consider. And this about wraps the whole thing up. All of these are great gaiters, and the things that you look for in the best hunting gaiters will depend on what you consider to be more important. Do you want the quietest gaiters as to not alert your game? Then get the Kenetreks. Or do you want the most durable ones? Then both Sitka and the Black Diamon are good choices.